Ever wonder what areas of concern you should be addressing on your Mustang before the nice weather hits and “spirited” driving becomes the norm? We’ve put together a quick checklist of areas you will want to give some love before racking up the miles on your Mustang. The first thing you want to do is check the fluid levels on less-noticed systems. Brake fluid should be checked and topped off by filling up to the maximum line. Find your owner’s manual and only use the DOT fluid specified for your particular Mustang. 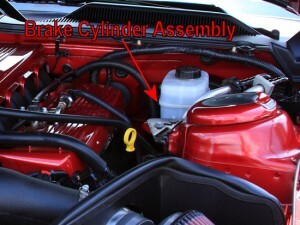 If your fluid level is unusually low, you will want to check for signs of leakage around the master cylinder reservoir. Next, take a look at your radiator reservoir. If you are low on coolant, you are going to want to top it off. Now, depending on where you live and the climate you experience, you can go with the recommended blend of anti-freeze/distilled water or, if you live in a predominantly warm climate and you are tight on cash at the time, you can use just distilled water. You DO NOT want to use tap or faucet water in your cooling system. The minerals and additives in water that has not been distilled can encourage further deterioration of the cooling system and cause costly damage. Relating back to using just water instead of a coolant/distilled mix–If you live anywhere that dips below freezing or are looking for anything other than a quick solution, you do not want to follow this method. The coolant is meant to keep your system from freezing. If you do not use the recommended blend, you risk the system freezing temperatures and could crack hoses or even split your engine block. Also, water reaches its boiling point much sooner than does coolant and therefore can hold and transfer more heat out of the engine and through the cooling processes. This, combined with the added viscosity of anti-freeze, are why you want to make sure you have the proper mixture and avoid freezing your system in cold weather and overheating in the summer months. After checking both the brake fluid and your radiator reservoir, take a look at your power steering fluid. There should be little or no movement in power steering fluid levels and if you see a significant drop from when you last checked, you might want to search for leaks. The same goes for your transmission fluid. Make sure you top it off as you would your engine oil–leveled out above the minimum marker. Now would also be a good time to check your maintenance schedule and see if you are due for a fluid flush. Those Mustang owners with automatic transmissions will also want to replace their transmission filters when having this done. Cooling System: There are many components on later model Mustangs that get a ton of use and, especially with older Stangs, need to be replaced over time. Your cooling system is a common culprit. You want to check all hoses and fluid lines for any leaks, cracks, or generally worn-out parts and replace them. An old-school way of knowing if you should replace your main coolant hoses is simply to give them a squeeze. If they feel firm they probably have a lot of life in them. However, the softer and easier they are to squeeze, the more you may want to consider picking up a replacement set. While you’re focusing your attention on the cooling system, check your thermostat and make sure it’s opening and closing easily. Belts, Battery and Air Filter: These components do wear over time and need to be checked and even replaced periodically. Your serpentine belt can become dried out, ripped and cracked. If you notice any of these issues, it’s better to stay on the safe side and throw a new belt on. Battery terminals should be checked for corrosion/rust and cleaned every year. If the cables themselves have any corrosion, it’s a good idea to clean and tighten them as well. Be sure to replace wires if you notice any rips or tears as they could become a safety hazard. 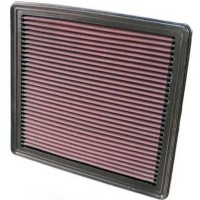 Next, check your air filter for a buildup of dirt and debris. If you find that it’s looking pretty dirty and probably should be replaced, now might be a good time to throw a high flowing aftermarket filter on instead. The initial cost is a little more than you would pay for a stock paper filter, but a premium filter will last you forever and can be cleaned fairly easily. You also may see a 1-3 MPG boost, in addition to some added horsepower and torque. It’s recommended you change your fuel filter every 20-30k miles as well. A good rule of thumb is to replace it when you first buy a used car, then get yourself on a set schedule. Each year, depending on how often you drive your Mustang, you’ll want to take the spark plugs out and inspect them. If there is any discoloration, you may have to address a lean or rich air/fuel mixture. Stock plugs on a relatively stock car are said to last 100k miles, but it isn’t a bad idea to replace them sooner if you drive your car hard or feel a loss in power, especially after taking a long trip. Plug wires should also be inspected and replaced, how often depends on the model year. Any melting, cuts or other abrasions should not go unattended and will warrant replacement. If you have a higher mileage Mustang, you might want to replace the wires at the same time you do the plugs to save yourself the time and aggravation of doing them later, not to mention reaping the benefits of having both new components working together. 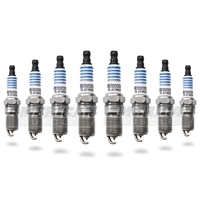 Spark plugs and wires are vital to fuel efficiency and performance of your Mustang and a key area to give attention to if your car is under-performing in either of these areas. For those who park their Mustang for the Winter months, you will want to flush out that old oil from last summer. By sitting, your oil can accumulate moisture that is not driven off like it would be during the summer months. It’s always a good idea to change the filter when you do the oil as well. While aftermarket filters are great pieces, if you’re short on cash the OEM Motorcraft filters are a great filter and should be more than adequate. If you drive your Mustang hard and want maximum protection, I would highly suggest choosing a fully synthetic motor oil in the weight recommend by your owner’s manual. Choosing a weight other than what is recommended by Ford may not provide complete protection and is a source of engine damage. Conventional oils need to be changed every three thousand miles, while fully synthetic change last a little longer–five thousand miles or so. If your Mustang sees a lot of track time, you might even want to change it sooner to stay on the safe side of things. 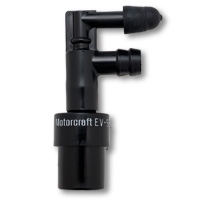 Your positive crankshaft ventilation valve, or PCV valve, draws air and unburnt gasses from within your motor’s crankcase and recycles them through the intake system. Over time, this valve can get clogged and needs to be replaced to restore engine performance. A quick check to see if you need to replace your PCV valve would be to remove it from the motor and give it a good shake. If you hear a loud rattle, you can probably wait a while before checking it again. If there is no rattling, or it is an inconsistent rattle, you’ll want to replace it. Luckily, PCV valves are easy to swap out and are relatively inexpensive. What’s easily considered the most essential safety component on your Mustang, the brakes are also one of the easiest to overlook until serious problems arise. For that reason, you should give the entire system a good once-over in the springtime, before you take the car out for any hard miles. After removing the wheels, if the rotors have any deep groves or gashes you’ll need to replace both rotors, whether it be front or back (replace the one on the same axle as the damaged rotor). Replacing just one is not suggested due to the two rotors being worn in different ways. Any signs of cracking or splitting is a huge indication you need to replace your rotors. Driving on a cracked rotor can be very dangerous–DO NOT IGNORE IT. Also, check for extreme warping of the rotors if you experience wheel shake while braking. Heavy or overuse of the brakes can warp the rotors and severely affect control while applying the brakes.Uneven or damaged rotors can also lead to premature wearing of the brake pads, yet another reason you should replace them if you notice any issues. Next, turn your attention to the brake pads. 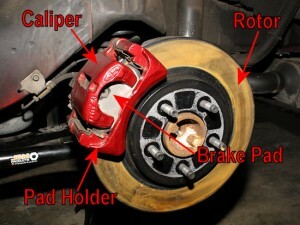 if you see uneven wear, this could be a sign of the rotors or calipers not performing properly. If the rotor looks fine, one of your caliper pistons may not be operating correctly. Pads that are at or close to the wear line (<1/8th inch) need to go. This is a great time to bleed your brakes and master cylinder, something that should be done at least once every two years. Over time, brake fluid accumulates water and breaks down in much the way that your other automotive fluids do. If you notice the color turning from an amber to a brown or black, it’s probably time to flush the system. 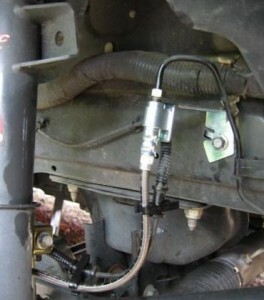 Finally, inspect all brake lines for any cracks or corrosion. Any signs of wear should be taken seriously and again, i would employ the “better safe than sorry” mentality. Next Entry Design Revealed: 50th Anniversary Mustang Logo For 2015!